This video demonstrates the standard big toe wrap around test site. 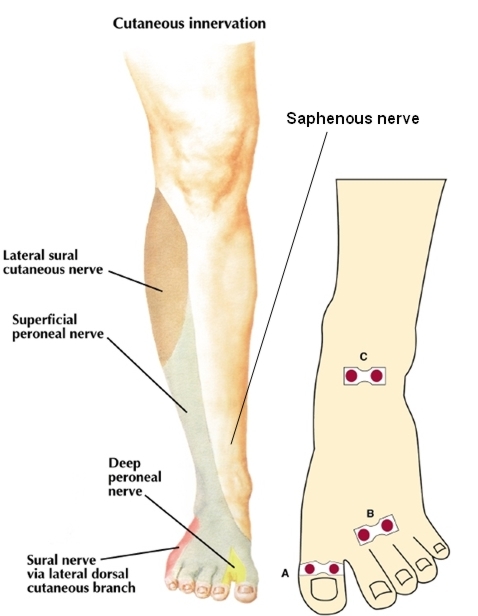 Includes L4 and L5 dermatomes and both deep and superficial peroneal nerves. A loss of sensory function at the big toe wraparound site "A" from a mono radiculopathy or a mononeuropathy will not be detected at this site. A polyneuropathy affecting multiple nerves and dermatones will be detected at this location, the most sensitive site in the body for dying back distal axonal polyneuropathy.